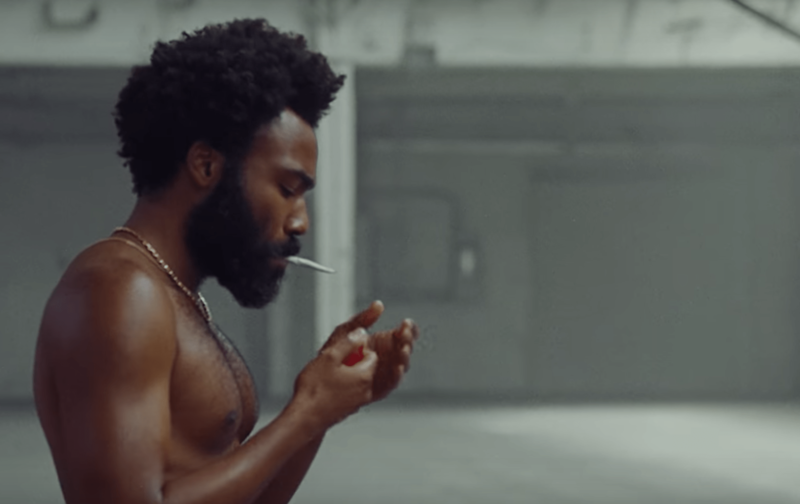 Childish Gambino just went and shook up the globe with his new video for ‘This Is America’. A social commentary, scattered with connotations throughout, you blink an eye and you miss them amongst the chaotic scenes of this satirical masterpiece. The song itself features Young Thug, Blocboy JB, Slim Jxmmi, 21 Savage, and Quavo, so the trap vibe with the presence of the challenging lyrics, already provide this video with a concept that is the key part of this piece of art. 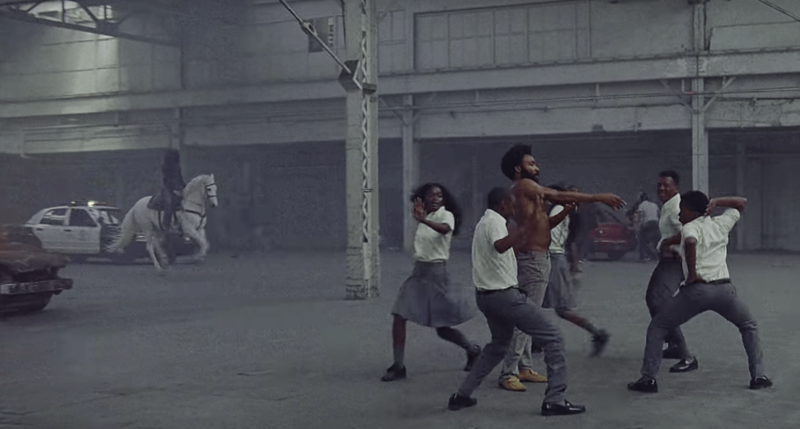 This video is Donald Glover’s representation of America, but we cannot just pass it off as irrelevant to us here in the UK, we need to take on board its underlying significance and themes. THIS IS IMPORTANT. This video is not only a piece of art, its representative of a generation and an incredible video, best of 2018? To fully digest it and see every aspect of what is portrayed, i’d recommend watching it a number of times. Here are some of the key discussions from my perspective: If you’re not bothered about reading the full breakdown, go ahead and read the final paragraph. THIS IS IMPORTANT. The transitions between African sounds, Gospel rhythms and Trap music match the shocking and sudden executions that occur. ‘We just wanna party’ and dance our way through life ignoring reality, and bang. This is America! The Charleston Shooting of 2015 is the clear connotation for the shooting down of the gospel choir. I think Glover chose this event specifically, because it is no longer at the forefront of peoples minds, but the visual depiction of this scene and seeing just how quickly Dylan Booth (the first teen to get the death penalty) murdered 9 black people inside a church, raises the shocking severity of what has happened and is still happening. We can’t just forget this one. andddd… breathe…. Glover lights his spliff after holding what seems to be the pose of aiming a gun, perhaps the only method to stay calm among the chaos? Sound familiar? With all of the school kids around him, the latest trap and dance moves provide a distraction to all of the madness happening behind them. There are so many things to focus on, but we become so fixated by the dancing and the music, that the rest becomes background noise. These visuals depict just how quick ‘American’s’ are to mask reality with partying and distractions. The transition between death and dancing exhibits the message: ‘Don’t be slippin’ up’, we have to keep our eyes open to what is happening around us. Stay Woke. This moment was so easy to miss in this video, but again highlights another major issue among African-American youth, but also young people here in the UK: Mental Health. The school kids using their phones to film or ‘snap’ the scene, raises the issue that Social Media is desensitising us to the pandemonium we see around the globe. Social Media is a phenomenon but also a curse. If its not on social media, it’s as if it didn’t even happen anymore. This symbol of death is well-placed, entering the scene next to a police car. Police Brutality due to racism is still one of the most public race issues that is picked up by the media. Yet again, this is disguised by the dancing in the forefront, we are so easily distracted. We go in and out of paying attention that when death crosses someones path, we notice but with our short attention spans, we allow ourselves to look elsewhere. Glover is the last person dancing on set, with the old cars, SZA in the scene, and the masked guitarist, he is singing about MONEY. It is as if the dancing is representing the desire for money and the distraction of it. My argument is that money is the primary focus and therefore, the largest contributor to the ignorance of the world around us. Just get your money, and everything will be alright. 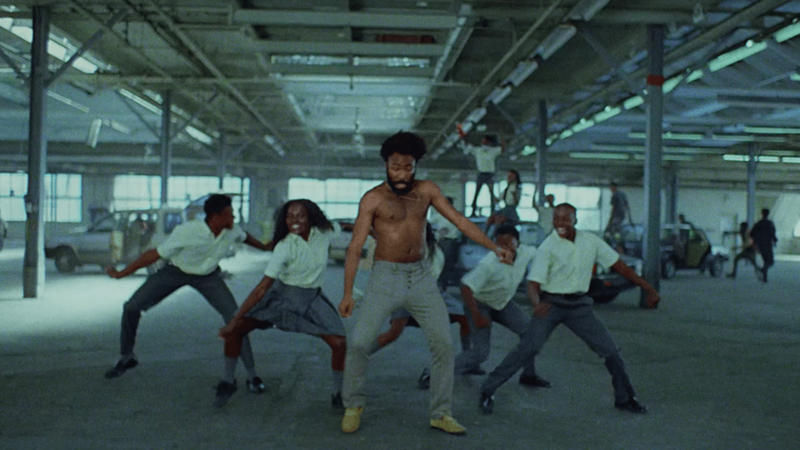 I’m sure there are a myriad of other aspects to this video that experts or Glover himself will point out, but the main thing to realise from this video is that this is not just America. We allow ourselves to become desensitised to what is happening in the world and in the UK. We can’t just sit by and accept the consequences. They had the Charleston massacre, we had the fire at Grenfell. They have gun violence, we have knife crime. We have to keep working on staying aware of what is happening around us. Stay Woke. Because This Is Our Reality too.